One of the cool things about Korea is that there is a number of subcultures flourishing, but many of them are so far underground that visitors (and even some locals) might never even suspect their existence. B-boy culture is one of these and while I knew it was present here, my exposure to it had been minimal. In areas like Hongdae and Hyehwa, it is fairly common to see young guys sporting the hip-hop look, but until this weekend, I had had no idea how big of a player Korea was in the b-boy world. The history of b-boy culture in Korea is quite interesting. It first appeared around the Michael Jackson era in the late 1980s but didn't really pick up until the early 2000s. 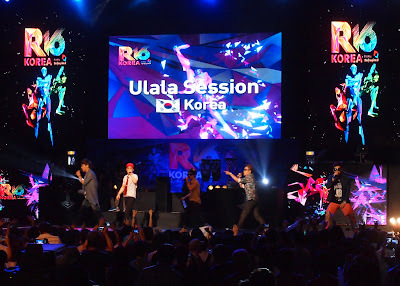 Since then, Korean crews have been recognized to be the best in the world for their innovative choreography as well as their flawless execution. 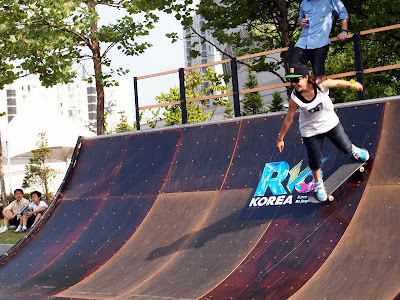 What started as a cultural import has now become an export, as the image of the b-boy is used to promote Korea as a dynamic tourist destination. For the past six years, the government has even sponsored the R-16 World B-Boy Masters Championship, known internationally as one of the most important b-boy competitions in the world. This past Sunday, I headed out to Olympic Park to attend the R-16, tickets courtesy of the Korean Tourism Organization. I arrived at the station on the side of the park opposite to where the event was taking place, but it didn't take me long to find it, as I had the hunch to follow the flat-bill hats and tattoos, something uncommon to see so much of in Korea. I was a couple hours early but there was already plenty of action going on. After picking up my tickets, I checked out the nearby street market, which consisted mostly of vendors selling urban clothing. There was a tent promoting the upcoming movie Street Dance 2, which was drawing a crowd. I soon realized there was a young kid on a mic encouraging the crowd to come forward and imitate some of the moves featured in the film. People stepped up confidently and I have to admit that I was impressed with a lot of them. I soon realized later that many of them were artists, either a part of the crews or were participants in the previous evening's individual championship. Guys showed off their moves at the Street Dance 2 promotional tent outside the venue before the competition. The R-16 featured many aspects of the urban lifestyle. 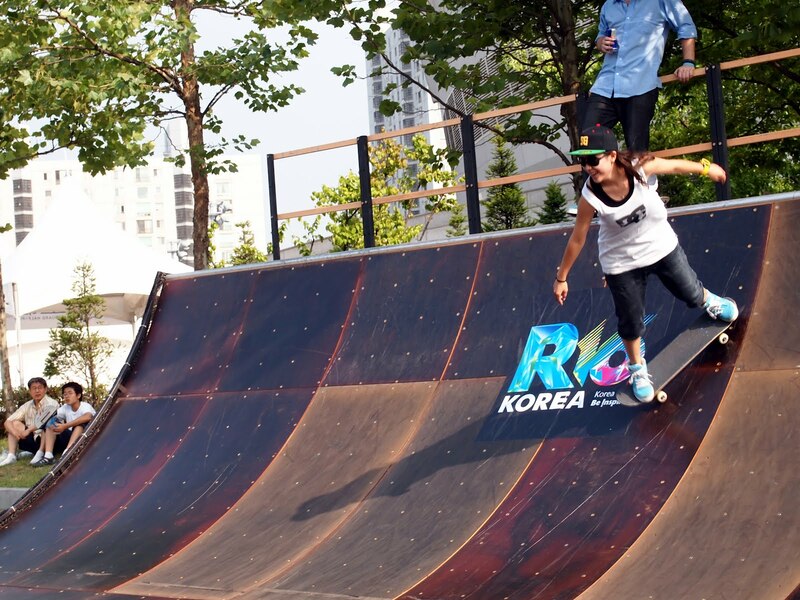 There was even a half-pipe where attendants could skateboard. 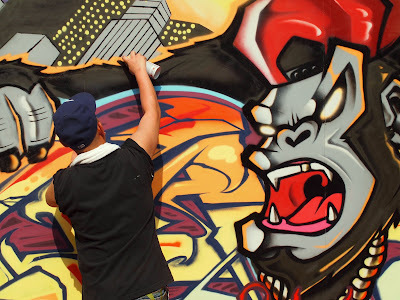 I headed over to the "Wall Lords" competition, which featured a handful of artists displaying their graffiti skills. As I took it all in, I realized how naive I had been thinking Koreans were a society of conformists. Here were hundreds of people actively involved in an alternative lifestyle, one that many of their family members and peers no doubt frown upon, and I felt overwhelmingly excited to be standing in the middle of it. I also felt a little depressed knowing that everyone around me was way cooler than I. But, I quickly came to accept that fact. A contestant in the "Wall Lords" competition creates cool graffiti art. I entered the venue when the doors opened at 5 and found my seat in the VIP/press section. (Yeah, be jealous.) The MCs soon introduced the schedule for the evening, as well as all the DJs, crews, and performers that would be featured. I was surprised to see that the R-16 was truly international, and that the "16" is actually the number of countries represented in the competition. The crew showcase was first and after the first few performances, I noticed that I was quite literally on the edge of my seat. The moves these guys were pulling off were mind-blowing and I couldn't help but be in awe of them. 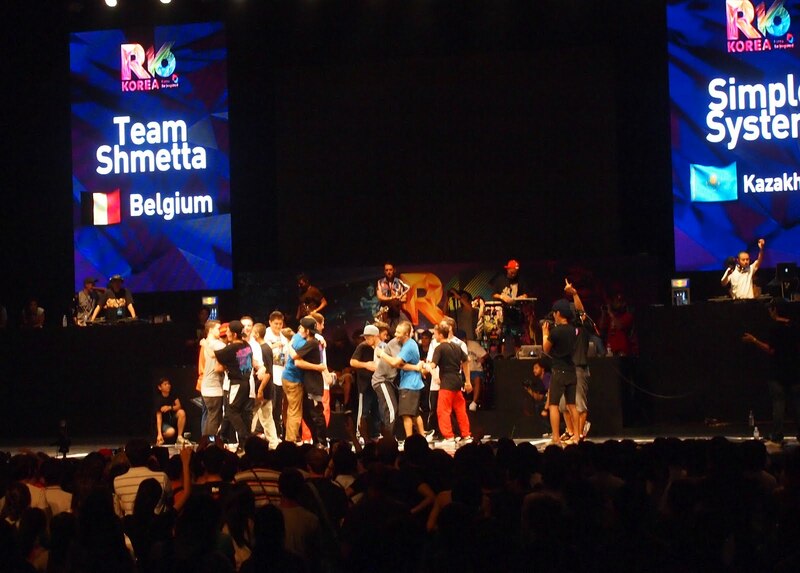 I was particularly impressed by Belgium's Team Shmetta that had an incredible amount of energy and added a lot of comedy to their routine. Korea's Jinjo Crew, who ended up winning the crew showcase, was also amazing, incorporating traditional themes into their modern performance. I was expecting to blown away by America's Massive Monkees, as they had done well on America's Best Dance Crew a few years back, but wasn't impressed. They took a risk by using classical guitar music in their number and because of it, the energy was low. Still, they made up for it in the battle competition, taking home first place. USA's Massive Monkees in the crew showcase competition. Korea's own Ulala Session rocked (and danced) it out in between showcase and battle competitions. I had never seen- but had always wanted to see- a real life dance battle. So, I was pleased when the battle competition started. As crews were judged on their foundation, originality, dynamics, execution, and battle, they pulled off their best stunts, moves, and luckily for us girls, their shirts. (Their abs were as impressive as their moves.) One nice thing to see was that after the winners of each battle were announced, the two competitors shook hands and congratulated each other on a job well done. It seemed that both the winners and the losers were genuinely happy to have performed. 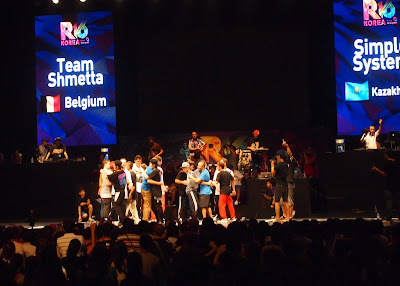 One of the MCs commented that this camaraderie is what the b-boy lifestyle (and the "R" in R-16) is all about: respect. Belgium's Team Shmetta and Kazakhstan's Simple System hug it out after their battle. As all the popping and locking came to an end, it was time for me to head home. Suppressing the urge to do the robot on the way to the subway station, I felt fortunate to be able to witness the b-boy subculture of Korea on a more personal level. The performances were definitely worth the hour-long trip out to Jamsil. The six packs were, too. Flares are typically accompanied by six-packs.